Erick Chavarria Erick Chavarria is a native of Mexico. He has been navigating Gringolandia ever since he moved to the U.S. at the age of five. He is very compassionate toward social issues and has been active in grassroots movements, particularly those aimed at Immigrant rights and Latino issues. He hopes to shift perspectives through his writing. Gerald Green A 19-year cancer survivor, Green released his memoir Life Constricted: To Love, Hugs and Laughter in 2010, which chronicles his family’s saga and victories over his three bouts with cancer: tongue cancer in 1995, neck cancer in 1997 and prostate cancer in 2008. His chapter, Fatherhood Love, appeared in the second edition of Black Fathers an Invisible Presence in America published by Routledge in 2011. Green’s poetry has appeared in the Healing Journey, an on-line publication, and The Monthly, a premier magazine of culture and commerce, has published one of his essays. Green’s writings reflect the importance of early cancer detection and the healthy impact of a loving family. Janice Davis Janice Davis is a recent Castlemont High School graduate who has pursued her interests as a writer through journalism and social media. Davis has been a staff writer and managing editor for the Castle Crier, Castlemont High School’s publication, and the Oa ktown Teen Times, a student-produced newspaper with readership in the thousands. She has also participated in student government, Educational Talent Search, and musical performance. Jimmy Jordan I am a 24-year-old young man coming from the diverse community of East Oakland. I currently work as a Health Technician at Cherry Hill Detox Center and a Health Coach at Highland Hospital for Alameda County. I was born and raised in East Oakland until moving to Stockton, Ca and back to East Oakland in 2011. As a young man living in East Oakland, I’m inspired to change my community. I want to tell about what's really going on in our streets which is commonly overlooked and undervalued from the younger generation’s point of view. I hope to make a difference in the community, city, and whole SF Bay area. Le’Ana Powell My name is Le'Ana Powell; I was born and raised in Oakland California. I am a bartender, student, advocate, domestic violence survivor, and a single mother of a 10-year-old son, JaRae Rutledge. I love music, dance, and many other forms of creative art. I also have certificates of completion in electronic assembly and as an EMT. I volunteer with numerous non-profit organizations addressing a wide range of poverty issues of Californians. One of my most immense accomplishments was in mid-2013 when I testified to the Senate Budget Committee and it voted unanimously to restore DentiCal benefits to low-income adults, effective May 2014. Sandra Muniz My mom came to the United States in 2000, while my dad was already here six months before my family arrived. We came for the American dream, however we were not notified that the individual has to survive, struggle, and cope in this land to reach the dream. Although we had to go through hardships to reach the position we are in now, everything we struggled for was worth the wait. At times I'm upset over the sacrifices we had to face as a family. For example, I was not able to protect my brother when he was bullied or advise him to protect himself from gang bangers. As kids we didn't comprehend why our parents were unable to help us. But as you get older, you understand that in those days not even your parents could help because they were in the same position as us kids. Sara Rowley Sara is a proud resident of the Clinton/East Lake area of Oakland, where she enjoys her current gig as a stay-at-home mom. She grew up in Minnesota and Colorado before moving to the Bay Area in 2006. She has a background in art and worked as a graphic designer for many years. She feels her connection to the community is best held by exploring new places, asking people about their stories, and bearing witness to the changes surrounding us all. Sergio Martinez Sergio Martinez was born and raised in Oakland, California, and currently lives in the Fruitvale neighborhood. He is a Public Health Practitioner by training, a part-time lecturer at San Francisco State and an advocate of social justice. He enjoys collecting vinyl records, travelling and roaming museums and art galleries. Shavonnee Clark Shavonnee Clark is an Oakland Native who is deeply connected to her city. She recently returned to Oakland after graduating from UCLA with a B.A. in Political Science and Education Studies. 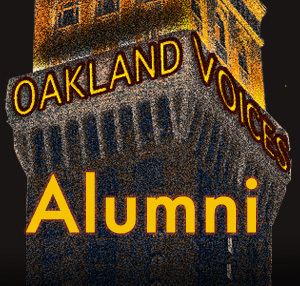 She has returned to Oakland to become an advocate in her community. Shavonnee is a scholar, educator, poet, and community member with a passion for art and story-telling. She truly believes that when you control the narrative of a people, you inherently impact the outcomes and opportunities of the community. For this reason, she currently works to get low income, first generation youth of color to and through college so that they may become agents of positive change in their communities. Tiffany Lacsado Tiffany Rose Naputi Lacsado was born on the island on Guahan (Guam) to a native Chamorrita and a Filipino contract laborer from Bohol, Philippines. As a child her family island hopped from Guahan to Hawai’i before settling and spending her most formative years in deep east Oakland, California. She is an alumni of Castlemont High School and has spent over a decade earning her bread and butter working in HIV/AIDS prevention and sexual and reproductive health promotion for LGBTQ youth and young adults. She is the founding member of One Love Oceania, an indigenous Pan-Pacific Islander Women's performance group and mother to Buhay age 2 and Shola - coming soon in October 2014. In the fall she will complete the University of San Diego Lactation Educator Counselor certificate program. Tom Webb Tom Webb was born and raised in Santa Rosa, CA. Since 1980 I have pursued graduate studies at the University of San Francisco (Theology, 1982), Duquesne University (Formative Spirituality 1994) and Catholic Theological Union (Pastoral Studies 2003). I have spent nearly 20 years living and working in the San Francisco Bay area as a Catholic high school teacher, lay pastoral associate and non-profit administrator. Additionally I have been involved in faith-based justice and peace and reconciliation efforts, including serving on the national council of Pax Christi USA. After spending nearly 13 years outside the Bay Area, I have now returned and serve on the staff of the Oakland Catholic Worker.